Often you want to create a ride listing for a ride that you have led in the past, or that someone else has already led. In this case, it is easiest to copy the old ride rather than creating it from scratch. This article gives you a quick reference for how to find and copy an existing ride. From the Lead Rides category select the tab for Submit a Ride. Click on the button for the Ride Listing Tool. Go through the process to log on if you have not already done so. Click on the toolbar button to Search rides. Enter some search criteria. 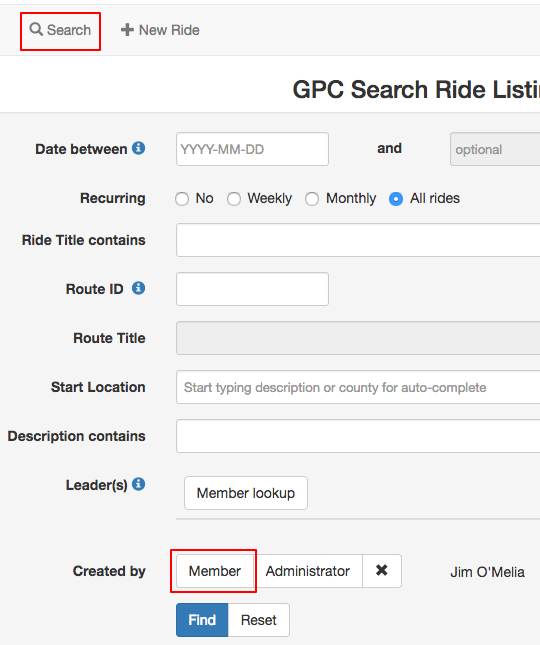 If you are looking for a ride that you created, it is often easiest to just go to the "Created by" field at the bottom of the form and click on the Member button. Then find and select yourself. Of course, you can also enter a variety of other search criteria if needed. Submit the form by clicking on the Find button. Your search may result in more than one match. If it does, click on the button next to the one you want. If there is only one match, you will go directly to the ride detail without seeing this screen. Review the old ride listing to see if this is the one you want to copy. If it is, click on the Copy button in the toolbar. You will now be on the page to create a new ride, except much of the information will already be filled in for you. You need only complete the missing information and edit anything else that you need to correct. Then submit the new ride.